New Delhi: The new BJP government has taken initial steps towards introducing the Hindu perspective in the education system. 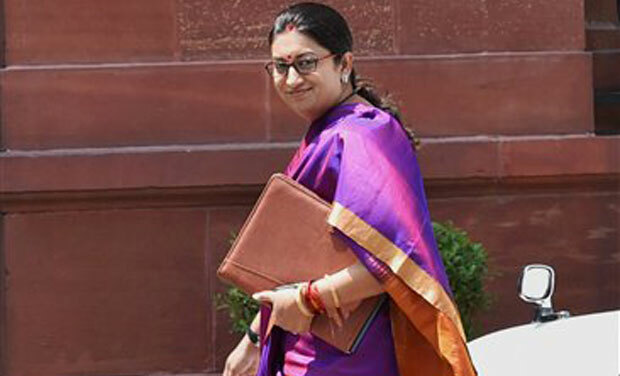 It is learnt that human resources development minister Smriti Irani has asked HRD officials to develop educational material that encapsulates the contribution of ancient Indians in different fields like science, mathematics, social sciences, philosophy, grammar and language. It is learnt that once evolved, this material could be introduced as chapters in the school curriculum. The ministry is planning to set up a committee to study the ancient Hindu texts, Vedas, Upanishads and other epics to select relevant material for teaching. To deflect criticism, the Modi government is likely to hold wide consultations with academics and others before going ahead with the move. Union HRD minister Smriti Irani brought this up during detailed interactions with senior bureaucrats in the past two days. She also articulated her desire to preserve the ancient culture and heritage of the country, sources said. This is being viewed as an attempt by the government to push through the RSS’ educational revamp agenda. The RSS has been critical of the Congress governments for ignoring the contribution of Hindu culture and religion to nation-building. The rightist organisations have labelled current textbooks as Left-leaning.